Itamar’s music blends the delicateness of Middle Eastern music, the freedom found in jazz and the passion of flamenco, creating a unique sound all his own. Recipient of the 2014 ACUM Prize for Special Achievement in Jazz and the prestigious 2014 Landau Prize, Itamar Erez is an internationally renowned composer and guitarist who has shared the stage with such musicians as Omar Faruk Tekbilek, Tomatito, Avishai Cohen, Jean-Louis Matinier, Zohar Fresco, and others. Itamar has released two CDs with his quartet The Adama Ensemble, “Desert Song” (2006) and “Hommage” (2010). His most recent release, “New Dawn” (2013), is a duet collaboration with Yshai Afterman (percussion), with special guest Antonio Serrano (harmonica). Itamar performs internationally and gives workshops and masterclasses, teaching his unique approach to music and guitar playing. During 2014-15, Itamar performed in Canada, USA, Germany, Netherlands, Austria, Cyprus, Israel, India, Tunisia and Colombia. Upcoming performances will be at the “Rogue Folk Club” & Vancouver International Guitar Festival (Vancouver BC), as well as at Carnegie Hall (NY), Drom (NYC) and Toronto’s Small World Centre April 2018. 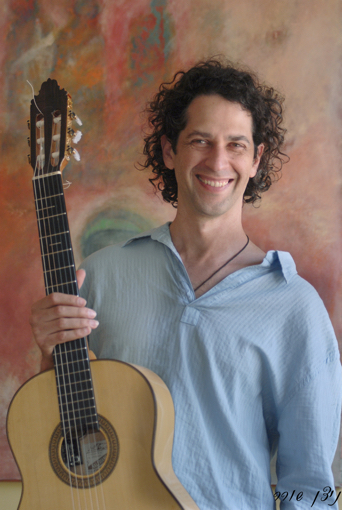 Itamar is currently working on new material for his next CD, and is on the guitar faculty at the Vancouver Symphony Orchestra School Of Music. His new book “Exercises & Etudes, an Advanced Method for the Fingerstyle Guitarist” was released March 2016. Developed from the last movement of the composer’s own Piano Trio, this is playful and rhythmic, based on a simple downward moving pentatonic phrase. Erez describes the piece as a kind of a chaotic/ecstatic dance, with some moments of relief, until the very exhausting end.